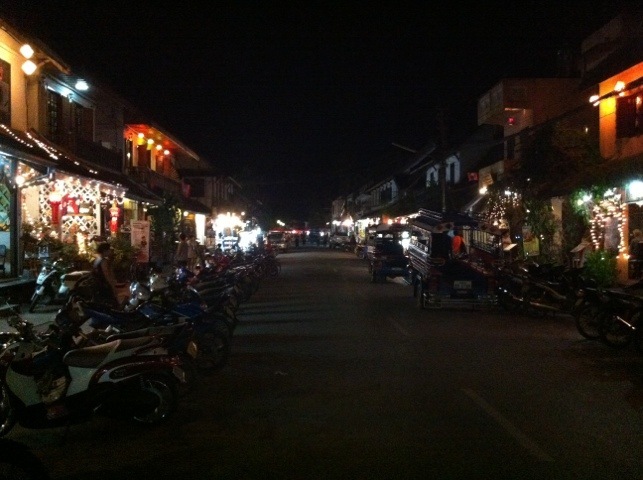 As I type this entry it is about 40 degrees and crazy humid in Luang Prabang, Laos. It makes me realise that I am seriously lacking in appropriate summer clothes (particularly ridiculous considering I live in the perpetual heat! ), however I’ll save that for another post. Luang Prabang is a laid-back town full of shiny gold temples (thirty-something the last I heard from a well studied Monk) and Monks who are spotted and dotted throughout the city in their saffron coloured robes. 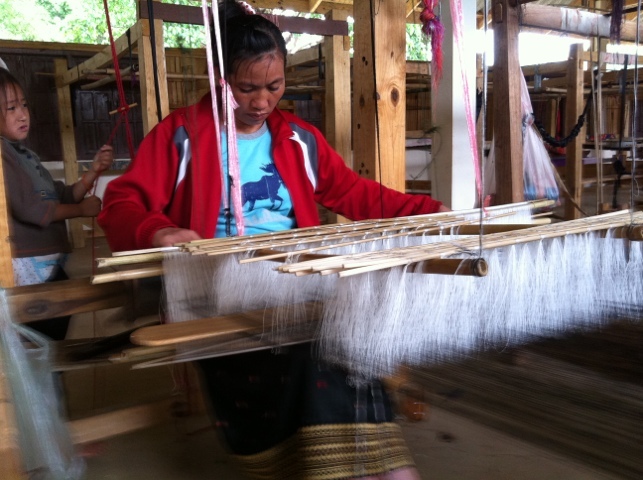 There is no question that Laos maintains a culture of deep traditions, but it is this along with the mix of Colonial heritage and an obviously blossoming tourism industry that really makes the country so great to visit. It’s chilled. Relaxed. And cool – despite the immense amount of heat being pumped out of the sky on a continual basis. It’s easy to get around and the people are very friendly. There is an abundance of eating establishments serving a selection of food covering the Laos and European spectrum, with French food playing a key roll – mostly in the form of crepes, though there a few fancy French restaurants too. 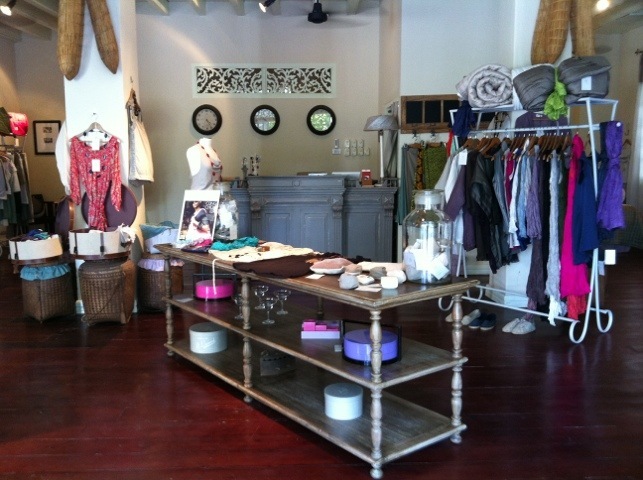 But Luang Prabang also boasts a fantastic number of shops and shopping opportunities. 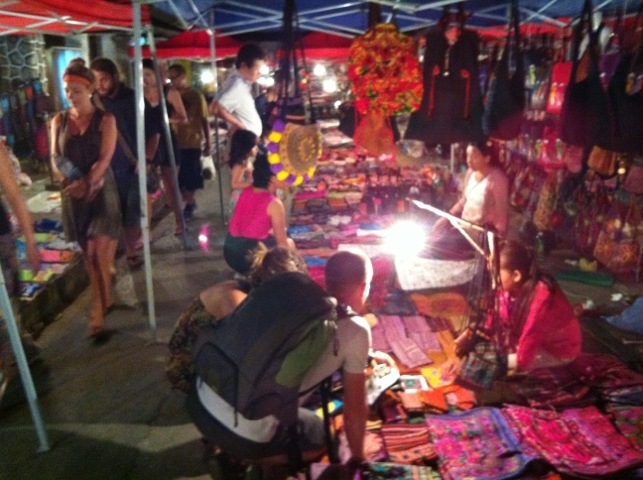 Boutiques, markets, stalls and kiosks will sell you handicrafts from small local villages, beautifully designed textiles, silver jewelry, Buddha images and Laos coffee to name but a few of the eclectic items on offer. There is something really special about buying a silk scarf from the woman who not only dyed the thread with which it is made, but who also spent two or three days weaving it. I find myself repeatedly trolling the night market stalls looking for interesting items (I’ve always loved a good market!). I’ve purchase some squares of fabric that are hand stitched and embroidered. I have big plans for these so stay tuned. Below are some snaps of my few days in LP. It has turned out to be one of my favourite holiday destinations. 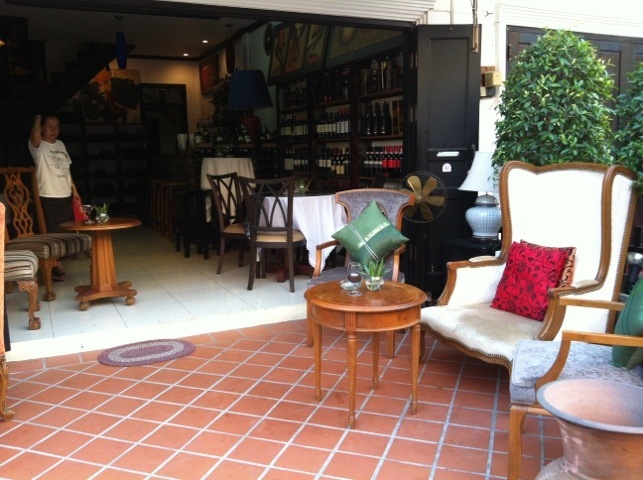 Pack Luck, an elegant wine bar serving the most delicious complimentary peanuts with fabulously cold wine. Where was your favourite holiday spot? 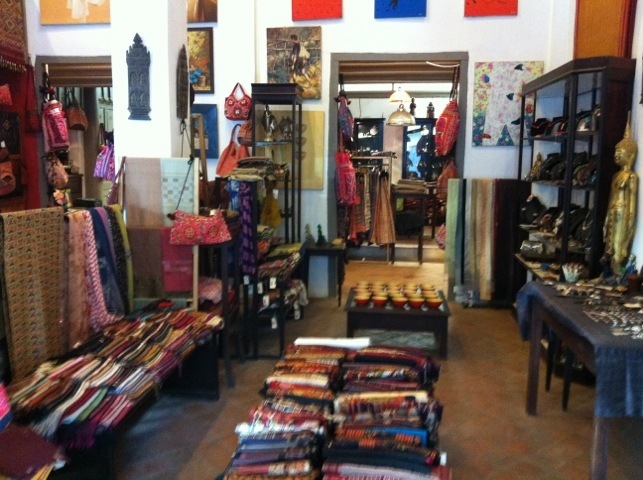 This entry was posted in fashion, interior design, travel and tagged handicrafts, Laos, Luang Prabang, market, Shopping by Earth, Wind & Style. Bookmark the permalink. It is such a great place to visit. Have you been to Laos? I highly recommend it! Oh it sounds fab, I love markets and just wandering around taking in the sights and smells. One of my fav places is Saigon/Ho Chi Minh City, I love the Vietnamese people who have so little and yet are willing to give so much. Its total madness, and then you stumble across an oasis a courtyard cafe that sells icy cold beer and fab food. Sigh…… I need an adventure. I believe you have an upcoming Northen Vietnamese adventure…! I’m going to be hot on your trail after that.